Home › Blyth's tragopan › Satyr tragopan - Tragopan satyra. Satyr tragopans belong to Phasianidae, the family of pheasants. 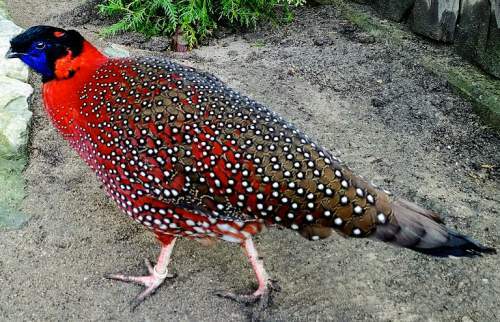 These tragopans are found in the central and eastern parts of the Himalayan India. Their habitat area spreads over Bhutan, Nepal, Tibet and India. They live at about 3000 meter elevations in the mountains and come down to lower elevations in winter. Their habitat includes temperate coniferous forests, oak forests, bamboo and rhododendron undergrowths. Male birds are approximately 70 cm in length and weigh about 2000 grams. There is marked sexual dimorphism and the males are larger than the females. They are also colorful and ornate than the females. Male bird have orange-crimson plumage on their their neck, breast and abdomen. They have spottings on the plumage, white spots circled by black. Their back dark brown in color. Their face is bluish with the chin being almost black. Their beak is black, short and strong. Their horns and orbital skin are a dazzling blue. The female birds are dull brown in color. 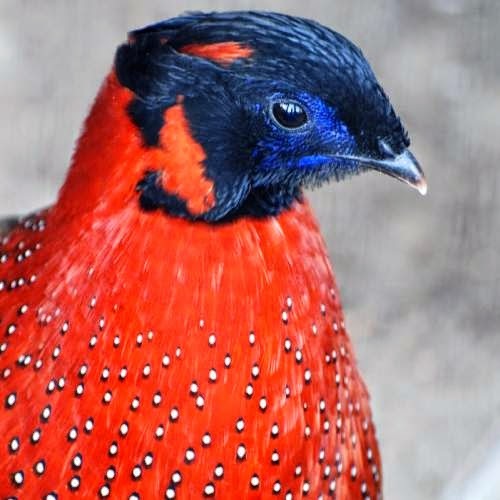 These birds are primarily omnivores, feeding on petals, buds, leaves, bamboo shoots, rhododendron seeds, bulbs, insects, earwigs ants and cockroaches. According to the (IUCN) the conservation status is "Near Threatened" in India and other habitats. Current topic in Birds of India: Satyr tragopan - Tragopan satyra.